November 07, 2016, 8:56 p.m.
Stephen Ansolabehere is Professor of Government at Harvard University and principal investigator of the Cooperative Congressional Election Study. Professor of Political Science at The University of Massachusetts Amherst and co-Principal investigator of the Cooperative Congressional Election Study. One of the largest pre-election surveys of the American electorate shows Hillary Clinton holding a 4 percentage point lead over Donald Trump. Among people who said they already voted early or absentee, her lead is 13 points. The Cooperative Congressional Election Study (CCES) interviewed 117,316 respondents across all 50 states from October 4th to November 6th. The sample was then pared down to 84,292 likely voters. Nationally, 43 percent of survey respondents chose Hillary Clinton and 39 percent chose Donald Trump for President. The remaining 18 percent either were undecided or chose Libertarian Gary Johnson, Green Party candidate Jill Stein, or another candidate. The survey was also designed to have representative samples in each state. In Alaska, Florida, Iowa, Nevada, North Carolina, Ohio, and Pennsylvania, Trump and Clinton are separated by 3 points or less. Statistically speaking, we cannot be confident of either candidate’s lead in these states. In the remaining battleground states, Clinton appears to have the edge. Trump holds leads in Arizona and Georgia. Clinton holds leads in Colorado, Michigan, New Hampshire, New Mexico, and Virginia. States in which Trump has a clear lead have total electoral votes of 188. States in which Clinton has a clear lead have total electoral votes of 253. There are 97 electoral votes in states and districts where the races are statistically too close to call. The Cooperative Congressional Election Study was conducted online by YouGov from October 4th to November 6th. Registered voters were raked to age by gender, race by education, age by 2012 Presidential vote, gender by 2012 vote, race by 2012 vote, education by 2012 vote, and state by 2012 vote. 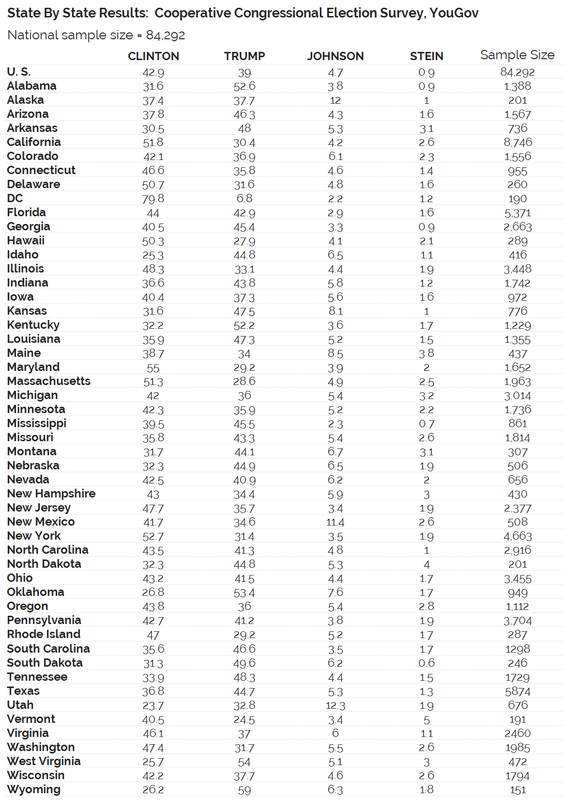 Unregistered voters were raked to age by gender, race by education, state by 2012 turnout, and state by white/nonwhite. Targets were obtained by imputing the 2012 CPS voting and registration supplement and 2012 NEP Exit Poll to the 2012 American Community Study and applying Census life tables to adjust for mortality. Current education was imputed using a logistic regression. The Likely voter weight was obtained by multiplying the registered voter weight by the probability of voting (1 for those who have already voted, 0.9 for those “definitely voting”, 0.3 for those “probably voting”, and 0.1 for those not sure). The CCES survey has been conducted every year since 2005. Details about past studies are available here and more details about the CCES survey can be found here.